Bring the elegance of Washington DC into your home with collectable plates, spoons and glassware featuring things like the Great Seal and the US Capitol Building. These patriotic pieces will be a delight to all of your guests! Enjoy your next hot beverage with 2019 NCBF official ceramic mug depicting artwork designed by Simon Bull. Our formal dinner plate features the United States Capitol surrounded by pink Yoshino and Kwanzan cherry blossoms. This plate can be used for meals or can be displayed in a china closet. 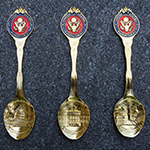 Three piece gold souvenir tea spoon set of famous Washington DC landmarks. These spoons are preserve a great travel memory and are popular with spoon collectors. 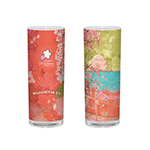 Complete your Asian dinner with official Sakura chopsticks and holder imported from Japan. The Washington's reputation as an avid gardeners is well known. Foreign governments, friend, admirers, even strangers supplied the Washington's with a steady stream of seeds, slips, bulbs, and cuttings from all over the world. Martha's formal garden charger plate is a large, decorative base setting for which other dinnerware is placed on top of during special occasions such as catered events, weddings, upscale parties, banquets, or in fine dining restaurants. Apotheosis Plate: Apotheosis Plate is 10 1/2''. On it is the beautiful painting painted by Constantino Brumidi. It features the fresco that adorns the oculus of the United States Capitol rotunda, "The Apotheosis of George Washington". Arches Wine Glass: With the Great Seal of the United States, fine crystal glass is best for any occasion. It has sophisticated looks. It adds grace to ones dining. Do'not Wait, Order your Now !! Great Seal Crystal Goblet: Crystal Goblet etched with the Great Seal of the United States is best gift to give to your loved ones. It is beautifully decorated with patterned traditional lines. Order Now !!! 7 1/2-inch Capitol Revere Bowl: 7 1/2-inch Capitol Revere Bowl has attractive looks. It is perfect gift for any occasion. It sophisticated looks adds elegance to dining. Do'not miss to Buy !!! 7 1/2-inch Footed Crystal Bowl: Diamond cut 7 1/2-inch Footed Crystal Bowl is perfect gift for any occasion. It features features an image of the U.S. Capitol with the words "We the People of the United States". Do'not Miss It!!! 9-inch Crystal Constitution Bowl: 9-inch Crystal Constitution Bowl: Revere-style bowl emblazoned with words inspired by the Preamble of the U.S. Constitution. It is crafted in heavy crystal. It looks sophisticated and centerpiece for all your gift giving needs. It is gracefully designed. Order Now !!! 7 1/2-inch Crystal Constitution Bowl: Revere-style bowl emblazoned with words inspired by the Preamble of the U.S. Constitution. It is crafted in heavy crystal. It looks sophisticated and centerpiece for all your gift giving needs. It is gracefully designed. Order Now !!! Capitol Presidential Bowl: Capitol Presidential Bowl has attractive looks. It creates prisms of light that cast their own shadows and rainbows of color. It has height of 5.75'' and diameter of 7''. A deep engraved detail of the Capitol, done by hand. Order Now !!! 7 1/2" Capitol Society Plate: Capitol Society Plate has 22kt gold image of the Capitol. Exquisite porcelain plate with rich cobalt trim rich cobalt trim. It has embossed border used as a gift by First Ladies. Order now !!! Kiplinger Salt & Pepper Shaker Set: Kiplinger Salt & Pepper Shaker Set has view of Washington City, 1871. Dimensions of shaker is 3 x 1 1/2-inches. It has features of art from the famous Kiplinger Collection. Capitol Platter: The Dimensions of Capitol Platter are 12.5" x 9.25". It has the 19th-century image of the Capitol. This platter is framed by elements of Constantino Brumidi's architectural motifs. This platter can be served as decorative centerpiece for the table, china cabinet display, or beautiful heirloom serving piece. East Front Dessert Plate: East Front Dessert Plats is 7 1/2''. It has an image of the newly renovated east front entrance to the U.S. Capitol building. It has border of maroon color and gold stars which is inspired by the architectural designs in the rotunda ceiling. Great Seal Charger Plate: 12-inch graceful Great Seal Charger Plate is best for elegant dining. The Great Seal of the United States with royal blue highlights looks beautiful. Very fine designs from the Brumidi stairwell on the Senate side of the U.S. Capitol looks great. Order Now !!! Capitol Charger: In diameter 12'', Capitol Charger plate is decorated around the rim with a Brumidi scroll pattern from the beautiful bronze brumidi stairwells on the Senate side of the Capitol. It has 24 kt. gold decorations both at the rim and in the center. Capitol Charger is very graceful for dining. Order yours Now !!! Great Seal Charger: 12" Great Seal charger decorated in kt gold is very attractive and adds elegance to any dining. In the center of the design, there is The Great Seal of the United States. It is based on an original design commissioned and presented for the 2004 First Lady's Luncheon hosted for Mrs. George Bush. It has precious looks. Don't Miss it !!! Great Seal Luncheon Plate: Great Seal Luncheon Plate is 7 1/2-inch and is decorated in 24 kt gold. It has Great Seal of the United States. Also it has been decorated with star which is so prevelant in the architecture of the U.S. Capitol. The American bald eagle is the most prominent feature of the Seal of the United States. The seal represents our desire for peace but our willingness to defend. 13 Stripes across the breast of the eagle represents 13 original states. Order yours Now !!! 3-PC Fine Bone China Embassy Place Setting: 3-PC Fine Bone China Embassy Place Setting includes 10 1/2-inch rim dinner plate, stella cup and syn saucer. Embassy eagle makes this setting a masterpiece. Ecru trimmed with 24 kt gold band makes it more attractive. Order now !! 3-PC Embassy Royale Fine China Place Setting: It contains 10 1/2-inch rim plate, stella cup and syn saucer. 3-PC Embassy Royale Fine China Place Setting 24 kt border trim and seal. Finest quality heirloom bone china looks very attractive. Order Now !! 9" Capitol Revere Bowl: Perfect gift of fine lead crystal bowl makes occasion more memorable. Its surrounding leafs makes it more attractive. It has diameter of 9'' and is designed in classic revere style. Don't miss it !!! Four Stages of Capitol Revere Porcelain Bowl: In diameter 8 1/2-inches and length of 4 inches, Four Stages of Capitol Revere Porcelain Bowl has attractive looks. 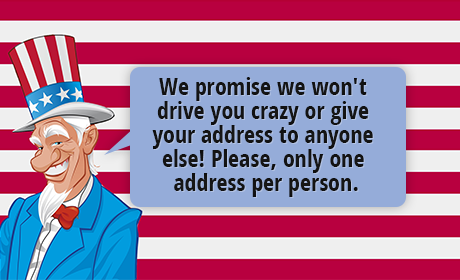 It is especially designed for United States Capitol Society. Inside it is 22kt eagle clutching a banner. Order Now !!!! Four Stage Porcelain Bowl: Heavy weight porcelain bowl is especially designed for United States Capitol Historical Society. It is highlighted with 22kt trim which gives unique look. Four images of Capitol building give this bowl very distinct look. In length 4 inches and with diameter of 10 inches this bowl is very attractive. Four Stage Presentation Bowl-Beautiful china bowl has heavy layer in 24-kt gold. It has features four major architectural stages of the Capitol Building. Great Seal of the United States looks attractive in 24-kt gold. The Four Stage Presentation Bowl has great looks. 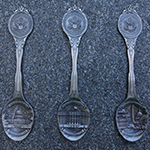 Three piece pewter souvenir tea spoon set of famous Washington DC landmarks. These spoons are preserve a great travel memory and are popular with spoon collectors. With their show-stopping performance each spring, cherry blossoms have become a widely recognized symbol of new beginnings. They are also associated with enduring friendship. Wow your guests with this stunning Abraham Lincoln Presidential China Dinner Plate. This historic reproduction of Abraham Lincoln's china is made from the White House collection and includes a certificate of authenticity. Featuring an American Eagle with olive branches and arrows along with the American Flag this decorative plate makes an excellent addition to anyone's collection. 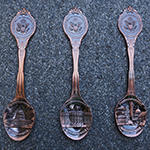 Three piece copper souvenir tea spoon set of famous Washington DC landmarks. These spoons are preserve a great travel memory and are popular with spoon collectors. 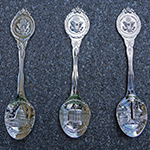 Three piece silver souvenir tea spoon set of famous Washington DC landmarks. These spoons are preserve a great travel memory and are popular with spoon collectors. This collector's ceramic plate features baked-on blue and white enamel and is finished in 24 k gold. The rendering of the White House is 24k gold on a presidential blue background surrounded by the words "The White House Washington, DC" also printed in 24k gold. Plate comes with decorative display stand and measures approx 8.25 inches in diameter. Complete your collection of Washington DC souvenir plates with this handsome ceramic U.S. Capitol plate featuring baked-on blue and white enamel and finished in 24 k gold. The rim of the plate is covered in 79 gold stars. Plate comes with decorative display stand and measures approx 8.25 inches in diameter. Crystal Cake Dome: Crystal Cake Dome has sophisticated looks. It has fashioned of fine Godinger crystal and is inspired by the dome of the U.S. It has weight of 22 pounds. The dome has dimensions of 12x12x12 . It adds an extra touch of elegance.